Are the Gloves On? Does Your Faith Really Work? My work, circa 1982. As a lad in rural Michigan, Dad assigned me to hard labor. Endless chores, full of drudgery—filthy and exhausting to the thirteen-year-old physique and attitude. Our small collection of farm animals needed fed, twice a day, whatever the weather. Fences must be maintained. There was grass to mow, hay to bail, trash to burn, weeds to pull in the two-acre garden—the task list grew each week. My internal war raged between wanting to please my father and longing to be lazy. Dad could readily see if a job was incomplete, so I worked hard to produce ample proof. Additional evidence of my hard work could be found upon examination of my scuffed and dirty, often torn and tattered gloves. In retrospect, those days were the source of great discovery, solid character-building, and yes, even long-term joy! In recent years, I have engaged in a season of next-level, personal assessment related to work. Does our faith really work? What evidence is there? 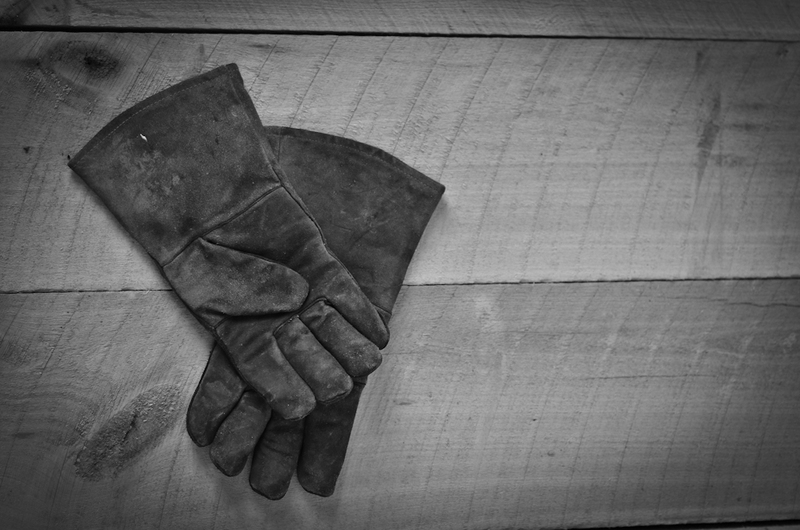 Are our faith-work gloves well worn, muddy, and threadbare? I know, I know. Yes, our faith works in a heart-changing, eternal sense. That’s not my arena of curiosity. Instead, I have been wondering if we truly take our faith to work in all our life realms, especially and including our daily workplaces? It seems our churches and broader faith communities thrive on thinking, studying and praying, contemplating, and pensively reflecting. We enjoy our faith within the holy huddle, when it spurs our intellect or euphoria. This is indeed all so meaningful and can advance personal development. But what about some faith that shows up strategic—even sweaty, dirty—exerting energy and action-oriented? In our dogged commitment to salvation by grace alone, through faith in Christ, we too often radically run from work. Perhaps in our quest for reformation salvation, we have come to believe that Ephesians 2:8-9 are the only verses that matter. We forget the Apostle Paul culminates this segment with verse 10. In our frantic fear of becoming a works-oriented, religion-based people, it seems we have over-reacted, relegating our faith to contemplation. We mystically worship on Sunday, but seldom consider the implications of taking our faith to the garage, boardroom, kitchen, store, or office. A major theme for Bonhoeffer was that every Christian must be “fully human” by bringing God into his whole life, not merely into some spiritual realm. To be an ethereal figure who merely talked about God, but somehow refused to get his hands dirty in the real world in which God had placed him, was bad theology. Through Christ, God had shown that he meant us to be in this world and to obey him with our actions in this world. Has the church truly sought to be as serious about faith in our daily workplaces as we are within the walls of church buildings or on global summer mission trips? Does my faith move beyond a cerebral, esoteric adventure? Does it actually create tangible difference-making—genuine momentum? Do we take our faith to work with the aim of producing amazing, creative, exceptional products, thereby reflecting the image of our Creator? Does my faith reflect a redeemed attitude, making me a coworker with whom others can actually enjoy working? Are we strategically praying and planning for how we can bless coworkers, clients, and other business contacts? Does our faith and daily work blend in such an authentic way that it piques coworkers’ curiosity, opening doors for verbally sharing more about Jesus? Such probing questions and James’ charge have triggered my searching season. This has been so personally poignant that I focused over two years of research, wrote my new book, Henry’s Glory, and now we will be launching a spring message series at Manor Church, dedicated to exploring Faith @ Work. If you have not yet, grab a copy of Henry’s Glory: A Story for Discovering Lasting Significance in Your Daily Work. Start reading it and enjoy discussing it with a friend. Start a book club with others to discover deeper faith-work correlations. You can even join the conversation by commenting below: Why do you think we struggle to take our faith to work? Eric Metaxas, Bonhoeffer: Pastor, Author, Martyr, Spy, (Thomas Nelson, 2010). Available on http://www.wipfandstock.com or http://www.Amazon.com.